As a professional eater and all-around food-culture obsessive, it's rare that an Anchorage eatery features a culinary offering that I have never even heard of. But so it was with Sno Flo Alaska, a funky little eatery featuring an eclectic array of Hawaiian specials (like poke bowls and spam musubi), acai bowls, creative smoothies and a full menu of specialty coffees. But it was the "Shave Sno" that caught my attention. Originated in Taiwan, shave sno resides somewhere on the spectrum between ice cream and shaved ice. Low-fat milk — rather than water or cream — is frozen into blocks, which is then shaved into thin, almost translucent ribbons of ephemerally flavorful snow. My daughter and I dropped in on a sunny afternoon for a midweek treat. The dining room is modern and sleek with a cozy play area for kids. A densely informative blackboard lays out the myriad of sweet options. 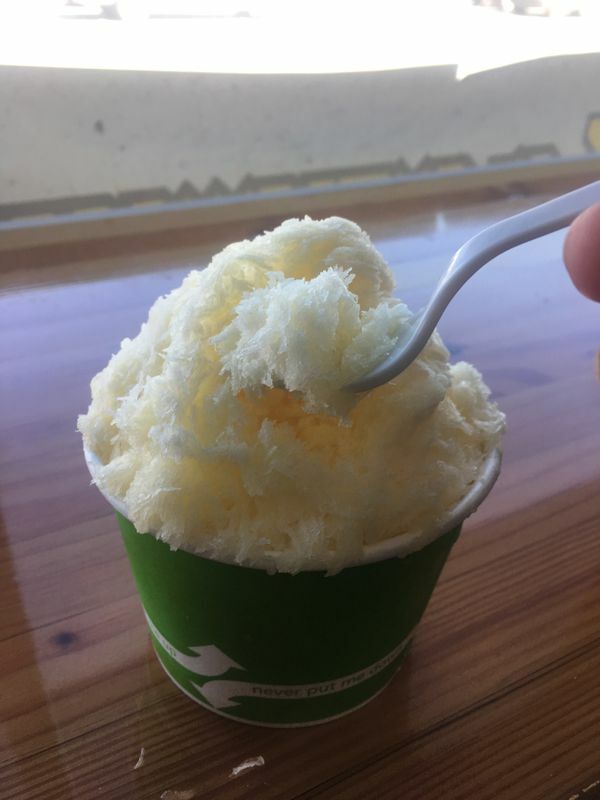 Determined to taste this confection in its simplest form, I opted for an unadorned cup of pineapple snow (small cup $4.50). My daughter, more indulgently, ordered chocolate snow with brownie bites and a caramel drizzle (medium cup $6.50). I have never tasted anything quite like it. The texture is light and feathery and dissolves on your tongue releasing the clean, fresh pineapple flavors as a sort of afterthought. Refreshing with just a hint of creaminess, I ate the whole cup in a sort of trance. It was decadent and satisfying without any cloying sweetness or regretful heaviness. The chocolate snow reminded us somewhat of the nougat inside a frozen Three Musketeers Bar. The flavor was mild and not overwhelmingly chocolaty. The addition of toppings jazzed this concoction up for my daughter, but I would have been content to eat this dreaminess naked, as it were, and to just let the cloud-like texture be the star of the show. We were in love. And now that we've been properly introduced, we might make our way over to some of the more adventurous flavors and combinations. We'll be back for Shave Sno in flavors like green tea, lychee, Nutella and taro. My daughter will no doubt add toppings like Fruity Pebbles, passion fruit, and lychee jelly, as well as "drizzles," like peppermint, raspberry and SnoCap (sweetened condensed milk). Bring on the dog days of summer. We have found the antidote. The exterior of the Chevron gas station at the corner of Boniface and East Northern Lights is, from a culinary standpoint, pretty unpromising. Dull, even. But inside, it hides something surprisingly delicious. So, in that way, it's kind of like…. a burrito? OK, OK, that was kind of a stretch. But the fact remains that this ordinary gas station is home to Burrito Factory, a locally owned, family-run Tex-Mex eatery that makes this Chevron a destination for more than just Slurpees, beef jerky and corn nuts. I have been hearing about Burrito Factory for ages but have never managed to be in the right place at the right time with the right appetite. Recently, however, the stars were in alignment, and I found myself in the vicinity on a day when I had skipped breakfast. I wandered in and promptly over-ordered. I chose a breakfast burrito to satisfy my immediate hunger and a carne asada burrito to bring home for later. You can tuck in at one of the two booths with a view of the parking lot, but I had my hounds with me and decided to eat, al fresco. at the dog park. My breakfast burrito landed on the picnic table with a satisfying thud. These hefty constructs are not for the faint-hearted. For me, the balance of ingredients is the most important aspect of any burrito, because it's hard to adjust its flavors once it's been wrapped. Tacos can be toyed with. Quesadillas can be dipped. But the burrito comes into this world complete. And these were perfect. The breakfast burrito ($9.95) was stuffed with eggs, bacon, cheese, sour cream and a choice of potatoes or beans (I opted for potatoes) and one of a number of sauces (I opted for green chile). This is the breakfast burrito gold standard. Filling, decadent, well constructed and perfectly balanced with just enough zing from the green chilies to cut through the rest of the gooey richness. The carne asada burrito ($11.95), which held up beautifully for re-heating later in the day, was similarly perfect. The beef was tender and well-seasoned. The hot sauce added pep to the creaminess of the beans, guacamole and rice. My husband shared this one with me, and I failed to disclose to him that I had already eaten a burrito that day when I divided it into two equal halves. I'm crafty that way. My family now has a new policy for road-trip preparations. Before heading out, we'll hit this magical Chevron to fuel up the car and ourselves. And, yes, we'll probably still also buy some corn nuts. Ambling through the rambling re:Made Store in South Anchorage is one of my favorite ways to pass an odd hour or two. Emphasis on the odd — part jumble sale, part craft market, part antique shop and part vintage clothing store, browsing through the array of steamer trunks, refinished furniture, up-cycled furnishings and old vinyl records puts me in a homey mood. The same can be said of the adjoining cafe. A cozy little room with a modest comfort-food menu (just a couple of sandwiches, a salad or two, a soup, and a daily special), it's the perfect place to take a break while musing over your impulse purchases (I didn't buy anything on my last visit, but I have my eye on a table lamp made from an old trombone). My favorite item on the menu is a rustic, creamy tomato soup ($6) with chunks of tomato, heaps of spinach, floating little islands of cream cheese and a hidden trove of cheese tortellini that turns this humble bowl into a complete meal. My only complaint is that it's served with a teaspoon and I wanted a bigger utensil. Specials change daily – recent options were chicken potpie and sloppy Joes – and items are available for takeout, like a family-sized platter of enchiladas and individual servings of pulled pork. It's a bit of a one-woman show, so consistency isn't its strong point. Things often sell out. The bakery display case is sometimes bare. But everything is prepared with love, and I've not been disappointed yet. On one occasion, I ordered a tuna sandwich ($6 normally, a simple, but satisfying, affair) and was only charged half price because they ran out of tuna mid-sandwich and the chef thought the portion was too skimpy (it wasn't). I personally love this friendly, personal, seat-of-the-pants kind of operation and it suits the venue perfectly. I recently described re:MADE cafe as having a neighbor who is a great chef and you find yourself dropping by right around mealtime just to see what's cooking. Re:MADE can be your neighbor too but keep your hands off of my trumpet lamp.